Over the last year many iterations of track have been tested. In October 2013 an entire loop of track was shown at BrickCon in Seattle Washington (see below) and ran very well (using a stock 9v train controller). 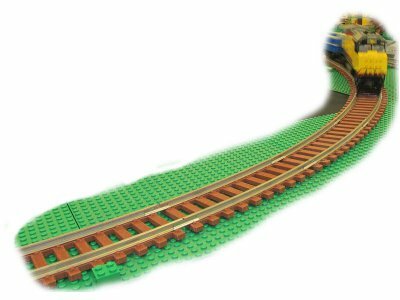 Moving forward Big Ben Bricks has no plans to develop tooling and injection mold train track for LEGO trains. Instead, the future for train track is with 3D printing. 3D printing is a way to 'print' your own plastic parts based on a digital 3D design. 3D printing technology is quickly becoming very accessible in terms of cost and ease of use. Further, the quality of print is quickly improving and the cost of the plastic is dropping as well - currently about $1 in plastic to print one piece of track. Only with 3D printing will it be possible to create the wide range of pieces LEGO train builders want at reasonable prices. With this strategy in mind, two types of track have been tested. Metal rail with plastic ties and all plastic track. Please see below for more information. Sample oval of metal track at BrickCon in Seattle, Washington - October 2013. For metal rail, code 250 Nickel-Silver rail and rail joiners are bonded to plastic sections of ties printed on a 3D printer. This provides an excellent running surface, excellent conductivity of the rail, good corrosion resistance and excellent conductivity between sections of rail. 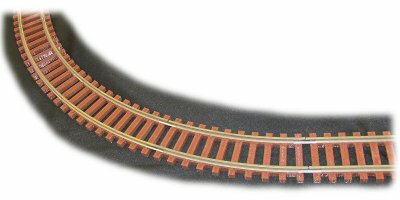 To achieve the layout shown above sections of track were made in three lengths of straights and three different curves. The metal rail on the curves is pre-formed with a simple rail bending jig and cut to length. The plastic ties are the shaped as two 1x8 plates stacked on top of one another. The ties are offset from the standard grid to allow full symmetry of the part. The code 250 rail is nearly identical in size to standard LEGO rail. The precision of the 3D print is sufficient to allow a full 32 stud long straight section to provide adequate 'clutch' power on LEGO baseplates. For those preferring battery powered trains, all plastic track is achievable too. Sample pieces were printed in a metallic gray plastic. Close up of all plastic curve. 3D printed curve connected to two standard LEGO curves. All plastic track printed well and provided a rolling surface comparable to standard, LEGO track. The very fine detail in the track joints is a challenge for 3D Printing, but in testing, while the joint was found to be a bit stiff, was still acceptable. The stiffness is mostly the result of using PLA plastic which is more rigid then ABS plastic. 3D printing is ABS is possible, but PLA is a bit easier to work with. Question: Will Big Ben Bricks sell 3D printed track? Answer: No. While the technology is advancing quickly, 3D printing is rather labor intensive. Others may be interested in printing track with their own 3D printers. Question: Will Big Ben Bricks make 3D designs suitable for 3D printing available for others to use? Answer: Provided there is enough interest, 3D designs will be provided for a nominal fee. For those that would like a sample 3D model, please email with a request. Question: What 3D Printer did you use? Answer: All track shown here are printed with PLA plastic using a MakerGear M2 printer. Fully assembled printers can be purchased for less then $2000. Question: Is 3D printing easy and trouble free? Answer: It is getting easier and more trouble free every year, but currently a little tinkering is typically required to make everything work just right.